The Pentagon’s “Ides of March”: Best Month to Go to War. Has the US “Declared War” on Venezuela? „Congress must reassert its constitutional authority over the use of force and responsibly end these interventions,“ said the Vermont senator. Juan Guaidó probably constitutes a violation of international law. Roger Waters > Bernie Sanders Bernie, are you f-ing kidding me! if you buy the Trump, Bolton, Abrams, Rubio line, “humanitarian intervention” and collude in the destruction of Venezuela, you cannot be credible candidate for President of the USA. Hands Off Venezuela: Historic Stance at the United Nations against US Imperialism – approximately 50 aligned states whose combined populations comprise more than half the people of the world now support Venezuela. In a spectacular display of solidarity and strength, envoys from distant capitals as Beijing and Havana, Moscow and Tehran, Pyongyang and Caracas, Damascus and Managua and numerous other states stood together, side by side, in front of the United Nations Security Council, declaring their determination to protect the UN Charter and International Law, and holding sacrosanct the sovereignty and inviolability of each member state. Maduro Says Russia to Deliver 300 Tonnes of Humanitarian Aid to Venezuela – „We receive humanitarian support every day. On Wednesday, 300 tonnes of Russian humanitarian aid will be legally delivered to the international airport of Caracas,“ Maduro said on Monday. Protest 8.2. 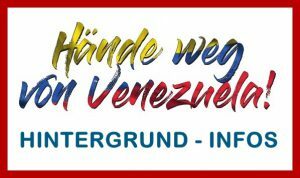 BERLIN #HandoffVenezuela Pueblos Unidos por #Venezuela! 8.2. United National Anti-War Coalition. Sign the petition against US aggression – Take Action Now! „Deputy Chairperson of the African Union, Thomas Kwesi Quartey, has sent a message of solidarity with the people of Venezuela and of support for constitutional president Nicolas Maduro,“ the Venezuelan Foreign Ministry wrote on Twitter. The message had been handed over to the Venezuelan authorities through the country’s ambassador to Ethiopia, the ministry added. Mexican President Andres Manuel Lopez Obrador called for a dialogue without setting any conditions.